Your ears and the earrings you choose give you an opportunity to show off your personality, and whether you’re about to have your ears pierced for the first time or are approaching the end of your healing period, now is your chance to pick a fun new earring style! Here’s what you should look for when choosing your next pair. If you’re getting your ears pierced, whether the earlobe or outer ear cartilage, we recommend stud earrings as the best earrings for new piercings. Our stud piercing earrings are made with a sharp tip and narrow post to gently pierce the ear and stay in place while the piercing heals. While some piercers do offer hoop earrings as starter earrings, we do not include them in our collection because they are easily caught or can get pulled while your piercing is healing. Once your healing period has ended, it’s time to change your starter earrings! For earlobe piercings, we recommend you continue wearing light stud-style earrings for at least six months. 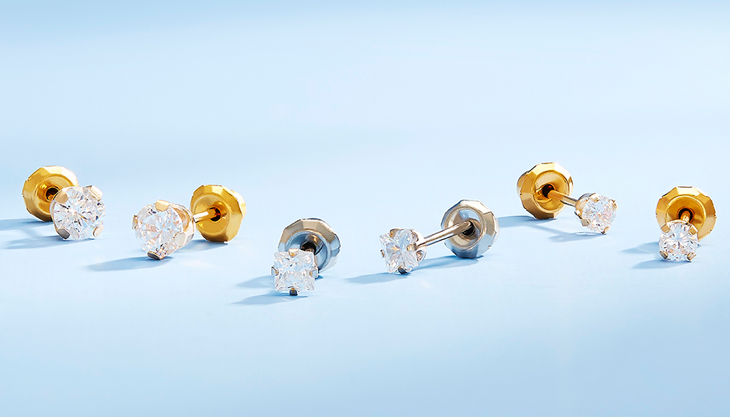 For cartilage pierces, we recommend stud style earrings for 12 months. Don’t be afraid to get creative with colors and shapes! If you’re just dying to switch your earrings out for those hoops you’ve been eyeing for months or the dangling earrings you got for Christmas, it’s important to wait until your ear piercing is ready. For earlobes, after six months you can change styles, and for cartilage the total healing period is 12 months. To learn more about Inverness piercing earrings, the styles we offer and more, visit our website today. For a piercing location near you, click here.